We received some positive feedback regarding the article on what you can get for $250,000 in the Tallahassee real estate market, so we'll target a different price range today as though we were buying a $400,000 home in Tallahassee. If you are planning on selling or buying a $400,000 home in Tallahassee, take a quick peak at what you will encounter in the market today. Before we dive in and look at homes in our targeted price range, it makes sense to first do a study of what has occurred in the recent past. There might be an opportunity to exploit, or a trap to avoid, and we can typically find it by studying what the buyers before us have done. In the real estate graph above, the number of homes that sold each year (priced between $400,000 and $500,000) are plotted in blue and measured on the left vertical axis. The average home size is shown in red and recorded on the right vertical axis. What we see is an explosion of homes sold between 2004 and 2008. To put this into perspective, there were 426% more homes sold in this price range in 2006 than there were in 2002. Though the graph does not show the 1990s, the 2002 level is higher than what was averaged back then. This means that the market produced a bunch of homes for the newly exploded price range, and it appears they were smaller than what somebody usually expects to get when spending upwards of a half a million dollars. This tells me a problem is brewing for home sellers in this price range, and thus opportunities abound for homebuyers. If the average homeownership period is 7 to 10 years, we should expect all the people who bought in 2005 through 2007 to want to sell their homes from 2012 through 2017. Based upon the current rate of demand, it appears that more than 300 of these sellers will not be able to find buyers! That's right, home buyers will have options, and sellers will be needing to "deal." Of course, it will get much worse if interest rates rise, as the number of buyers who will be able to afford a $400,000 home in Tallahassee will drop dramatically. The following list shows all homes sold priced between $400,000 and $499,999 since the beginning of 1991. If you are planning on selling a $400000 home in Tallahassee, do it while interest rates are still low. You will have more buyers to whom to market your home, and a better chance of getting it sold. 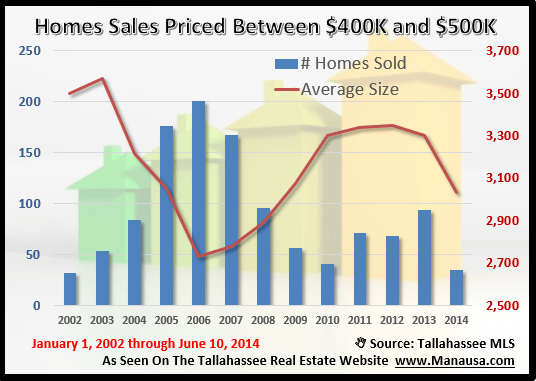 If you are planning on buying a $400000 home in Tallahassee, you will have conflicting incentives. From a supply and demand standpoint, you are in no hurry. There are plenty of these homes available, and there will continue to be plenty for years to come. HOWEVER, interest rates will be rising after the elections, so your monthly cost of ownership will rise at a faster rate than values might fall. You would be wiser to consider both rates and values before you make a move. If you would like to know more about buying and/or selling a $400,000 home in Tallahassee, simply drop me a note and we can schedule a time to help you review your best courses of action.